ESS 740-0494 Crossbow Polar ONE Polarized Gray Lenses Glasses FREE SHIPPING! This ergonomic, non-slip ballistic eyeshield helps you to keep your eyes on the target. The polarized gray ESSOPTICS lenses are treated with ClearZone FlowCoat to prevent fog and scratching, keeping your view clear and undistorted. 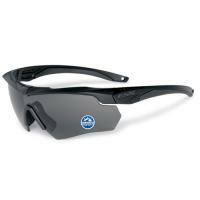 They are also fully UVA and UVB proof and thick enough to withstand combat conditions. The DedBolt Lens Lock system makes changes quick and easy, but once locked it stays locked even under impact. The Crossbow eyeshield can accommodate lenses from the ESS Crosshair and Suppressor as well for maximum versatility. The eyeshield is fully compliant with US Federal OSHA requirements for eye protection, as well as Europe's similar CE EN 166 guidelines. ©2002-2019 CopsPlus.com: ESS 740-0494 Crossbow Polar ONE Polarized Gray Lenses Glasses FREE SHIPPING!